Virgin Mobile is making fun of Australians’ smartphone habits in its new integrated campaign featuring Glee star Jane Lynch. Virgin Mobile’s new marketing campaign, ‘Making Mobile Better’, includes a TVC and an online project that incorporates social media with charity. The campaign’s #mealforameal project aims to give meaning to the often banal habit of posting food snaps. Every time someone uploads a food image to Facebook, Twitter or Instagram with the hashtag #mealforameal, Virgin Mobile will donate a meal to someone in need through OzHarvest. 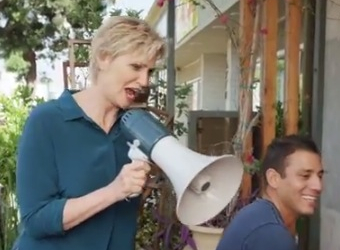 In the TVC, US comedian and Glee star Jane Lynch asks, ‘What the phone Australia?’ urging Aussies to rethink some of their mindless smartphone habits. The ad will air on free-to-air and subscription television and cinema. In a longer online video, Lynch parades the streets without a mobile phone, demonstrating the absurdity of many social media habits by checking in through a megaphone and handing out polaroid photographs to strangers. In true Virgin style, Virgin Mobile’s team will also walk the walk, with the implementation of new internal activities incorporating the ‘making mobile better’ ethos into its corporate culture. This will include having mobile-free meetings and a policy to reduce the sending of non-urgent emails out of work hours, encouraging work-life balance. Virgin Mobile director of brand and communications, Nicole Bardsley said the campaign showed the company’s commitment to improving customers’ mobile experience through innovative products, good service and value for money. “Our new brand positioning recognises Virgin Mobile as a brand that is growing up, but still willing to shake things up in the market! For years we’ve believed in giving our customers a fair deal and feel it’s our role to make the mobile industry better by keeping the pressure on the big guys. Additional media support will include major national outdoor, digital, display, pre-roll video, mobile executions and Facebook advertising, as well as tips and tricks for making the mobile experience better.